Welcome to the twentieth (#20) dividend income report, covering earnings I've made from dividend-paying stocks, peer to peer lending (both fiat and cryptocurrencies) in December 2018. In case you are wondering why I'm sharing online my earnings - the answer is pretty simple - back in January 2017, I set a goal to reach one million dollars in my bank account by the time I will turn 60 26 years still to go). I believe in transparency and sharing dividend income reports every month helps me to observe my personal progress or bounces. Hopefully, those reports can give some inspiration to you as well. (If so, please leave a short comment below). In short, last December turned out much better as I thought before. Despite last December was the first month when YOY growth was negative, I still really love this December. More on that bellow. In total there were 10 great companies paying us dividends in December. The YoY growth rate for my dividend income in December was negative - 7.53%. or it was 13.07 less than a year ago. The explanation is simple - SAF Tehnika from the Nasdaq Baltics decided not to pay out dividends this year and there were no extra from Latvijas Gāze, as it was in 2017... 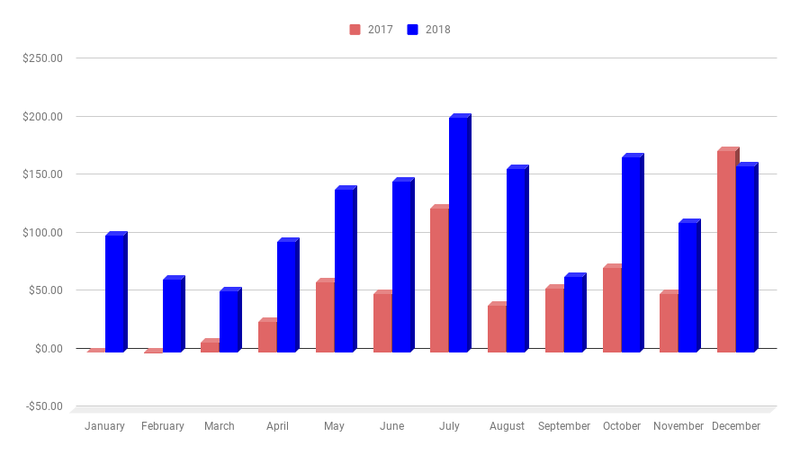 Despite I made less than a year ago I feel really strong regarding December, it's much better diversified than a year ago, and when speaking about goals for December 2019 I can see really good month here, but more on that at the end of the article. The cumulative earnings for 2018 now are $1,466.83 which is exactly 122.24% from my goal of 2018 ($1200). Awesome I have beaten my yearly goal by extra $266. Isn't that awesome? Now, when setting goal/forecast for December 2019 I have a $240 goal for the December 2019. From today's perspective looks very possible.